This week’s episode featured the couple’s five-minute guest appearance on MBC’s radio show, “Shindong & Park Gyuri’s ShimShimTaPa”, where they exclusively announced their leave from the show for their last ever ‘couple’ mission. Ga-In first broke the news of the “Adam Couple” virtual marriage coming to an end in tears, which led to Kwon also shedding tears of his own while expressing his thoughts about their leave. During their interview, the couple stated, “We didn’t think a day like this would come. We should’ve just failed the mission…”. 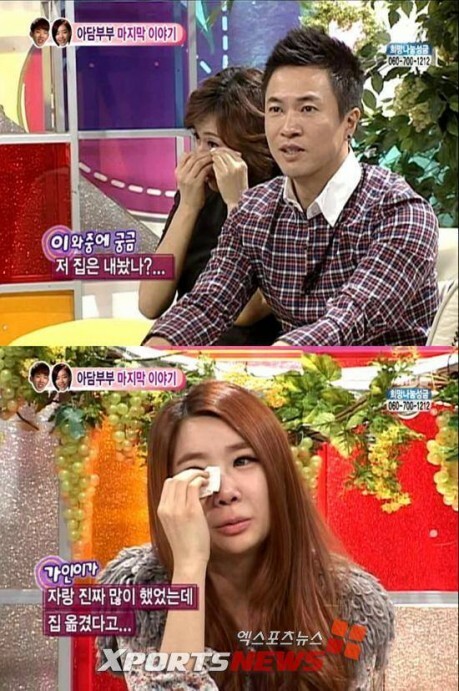 Studio cast members Park Mi Sun and Brown Eyed Girls’ Jea also showed tears of disappointment during the heartbreaking announcement. As a way to lighten the mood, Park Mi Sun jokingly asked, “Is their house back on sale?”, causing everyone to laugh. This entry was posted on January 16, 2011 by redtofu. It was filed under Boy Band, Girl Band, Variety Show, Videos and was tagged with 2AM Jokwon, Adam Couple, BEG gain, We Got Married, WGM.